The Economic and Financial Crimes Commission EFCC, has obtained a court order from a Federal High court in Abuja to keep the immediate past governor of Ekiti state, Ayo Fayose, for two weeks. 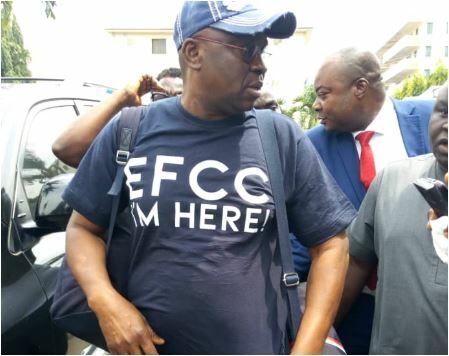 Fayose whose tenure ended on October 16th, arrived the commission’s office in Abuja on same day to answer questions on some allegations of fraud. Fayose is being investigated for his alleged role in the $2.1 billion arms procurement fraud. He is alleged to have received N1.3 billion from the Former Minister of State for Defence, Musiliu Obanikoro, which was used to allegedly rig the 2014 state governorship election in his favor. A source in the commission, says the court order for his continous detention was obtained yesterday October 17th.